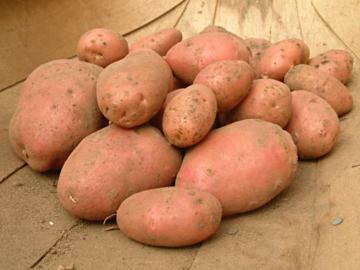 Main Crop potato producing tubers with red skin and pale yellow, firm textured flesh. Foliage is green to bluish-green. Numerous very pale purple, almost white, flowers. Very popular variety. Resistant to drought but can be susceptible to scab and eelworm. Plant out tubers in mid April for harvesting in August or September. The top-growth is not frost hardy, though the tubers will tolerate a few degrees of frost. Culinary vegetable with good flavour. Good for baking, boiling, roasting or frying.